The University of California, Davis has conducted continuous monitoring of Lake Tahoe since 1968, amassing a unique record of change for one of the world's most beautiful and vulnerable lakes. In the Tahoe: State of the Lake Report, we summarize how natural variability, long-term change. and human activity have affected the lake's clarity, physics. chemistry, and biology. We also present on all the most recent data and research from the previous year. While Lake Tahoe is unique, the forces and processes that shape it are the same as those acting in most natural ecosystems. As such, Lake Tahoe is an indicator for other systems both in the western United States and worldwide. 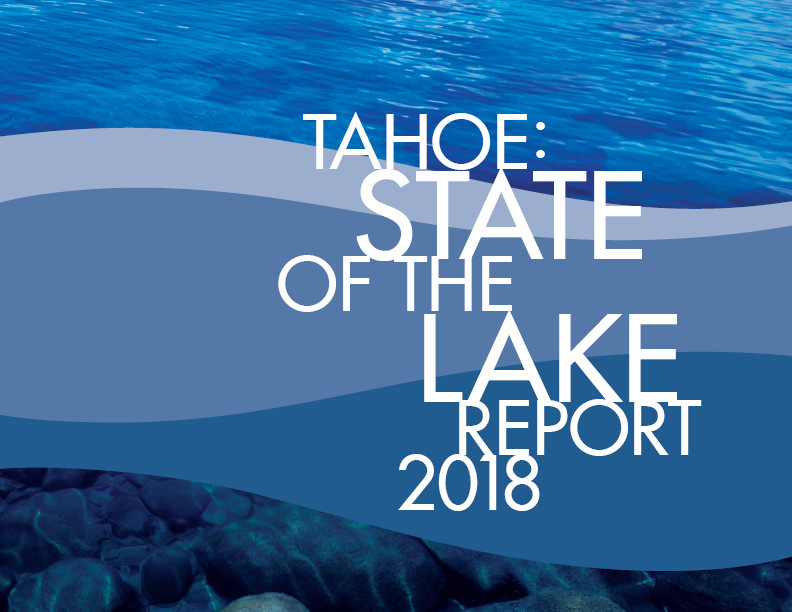 After a year marked by extreme weather and plunging clarity levels, the UC Davis Tahoe Environmental Research Center today released its annual Tahoe: State of the Lake Report. The report dated 2018 summarizes data collected in 2017 as part of the Center’s ongoing, decades-long measurement programs, while also presenting current research on emerging issues. 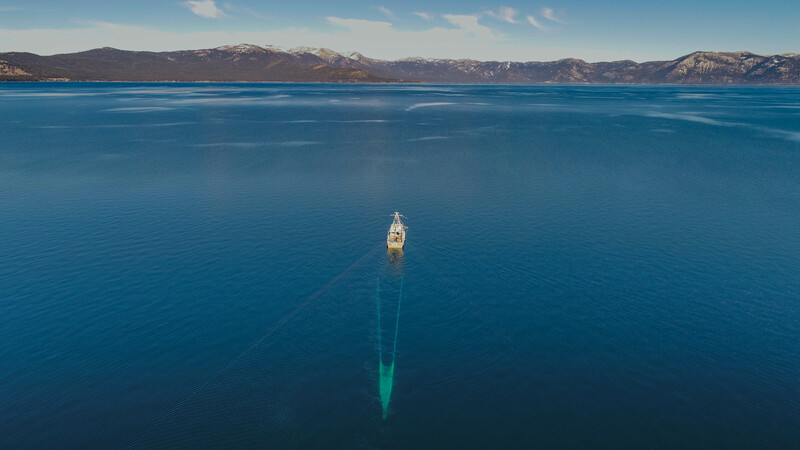 This includes updates about the dramatic change in Lake Tahoe’s clarity in 2017, a study to characterize the nearshore and its impacts on algae, climate change indications, forest health and restoration, and an upcoming comparative study between Lake Tahoe and Lake Geneva. Lake Tahoe’s average annual clarity in 2017 was at its lowest level, 59.7 feet, since regular measurements began in 1968. This was likely due to the one-two punch of the end of a five-year drought followed by a winter of record-high precipitation levels that extended well into the spring. More sediment washed into the lake in 2017 than the previous five years combined. Clarity readings from the first half of 2018 indicate that clarity is back in its normal range, suggesting 2017 was an outlier. Nonetheless, the report said the decline highlighted the reality that extreme climatic and hydrologic events will become more common in the future and that current monitoring efforts need to be reviewed and upgraded to prepare for them. Past efforts to restore lake clarity primarily have focused on land-use management. The report said recent research shows a parallel ecological approach could accelerate progress. For example, a pilot project in Emerald Bay is testing whether removing invasive Mysis shrimp could restore the native food web and help sustain clarity improvements. Winter monthly air temperatures were cooler than recent years, but average temperatures were warmer during summer. In 11 of the 12 months, air temperatures were higher than the 1910-2017 average. Lake temperature was the warmest on record. Surface water temperatures in July 2017 were the warmest ever recorded at 68.4 degrees, which was 6.1 degrees more than in 2016. Water Year 2017 (Oct. 1, 2016-Sept. 20, 2017) was the second wettest on record, with 68.9 inches compared to the long-term average of 31.6 inches. Nitrogen and phosphorus loads were also at record levels in 2017 due to high streamflow. Suspended sediment was also high, particularly in Ward and Blackwood creeks. TERC climate change researchers are applying downscaled future climate projections to the Tahoe basin. 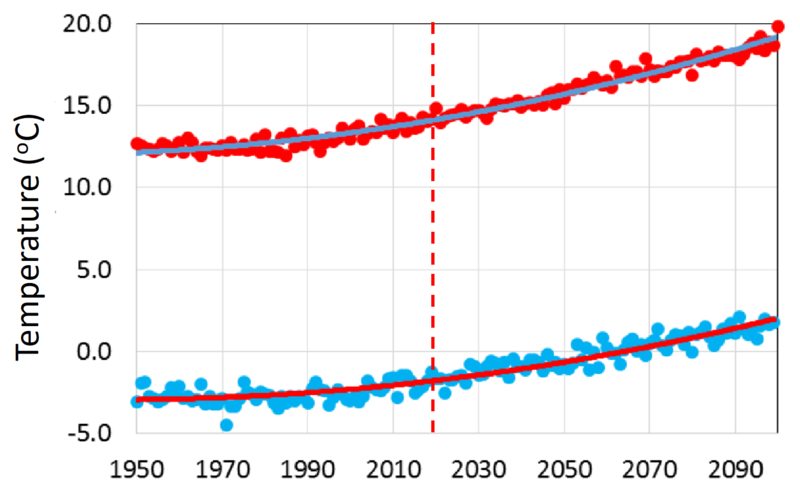 The results suggest air temperatures will rise by 7 to 9 degrees Fahrenheit between now and the end of the century. The watershed will also dry considerably, particularly on the north and east sides, adding to forest stress and wildfire risk. 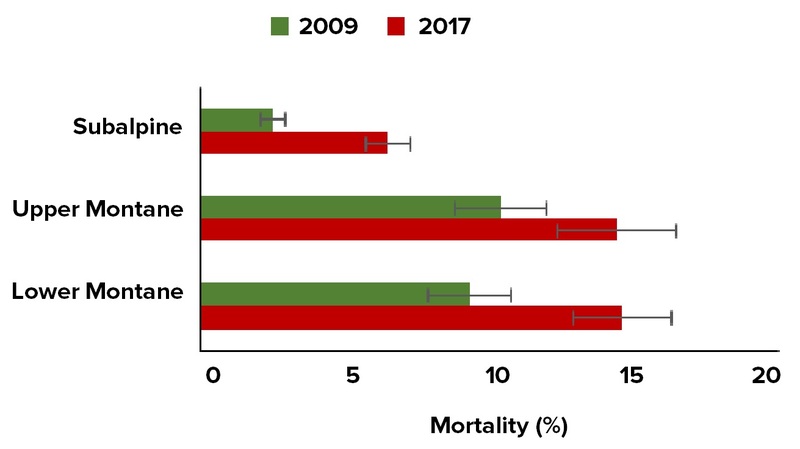 Forests surveys in 2009 and 2017 — before and after the drought — showed increased mortality throughout the Tahoe Basin. Large stands of sugar pine along the north shore were particularly affected by mountain pine beetle. TERC is collecting seeds from sugar pine trees that survived drought and mountain pine beetles, and are likely more resilient to climate stress. 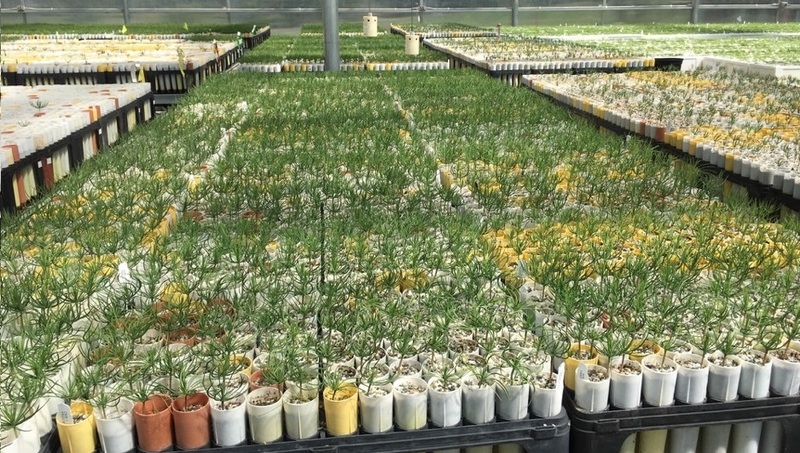 Seedlings produced from the project will be available to revegetate affected stands. Forest surveys have also shown that stands that did not receive forest treatments, such as thinning or prescribed burns, had higher populations of mountain pine beetles. A new turbulence probe on the UC Davis autonomous glider is being tested in Switzerland’s Lake Geneva to better understand how contaminants move around that lake. Measurements at Lake Tahoe in 2019 will form the basis of a comparative study between these two iconic lakes. The UC Davis Tahoe: State of the Lake report informs nonscientists about the most important factors affecting lake health. It also intends to provide the scientific underpinnings for ecosystem restoration and management decisions within the Lake Tahoe Basin. The report’s production was funded by the California Tahoe Conservancy, Incline Village Waste Not Program, Lahontan Regional Water Quality Control Board, Lake Tahoe Marina Association, League to Save Lake Tahoe, Nevada Division of Environmental Protection, Parasol, Tahoe Fund, Tahoe Lakefront Owners Association, Tahoe Regional Planning Agency and Tahoe Water Suppliers Association. Previous State of the Lake Reports are available here.